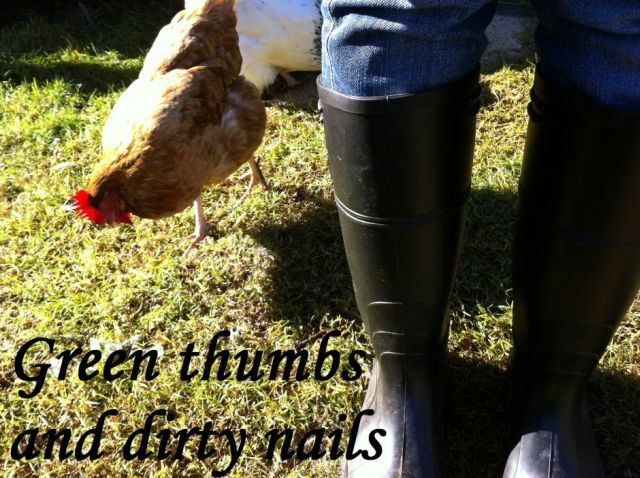 Green thumbs and dirty nails...: Birds of a feather. Recently I had been feeling guilty over the smallness of the run I had designed when I built my chickens' enclosure. Jamie and I mused about how the run could be expanded whilst not absorbing too much more of our yard. We decided to expand the run along the fence, enclosing a large bushy tree, mondo grass and a pond. I have read that chickens feel safe hiding in shrubs, so I figured the girls would enjoy hiding in the bushy bits near the pond. A Gumtree advertisement, one phone call and a half-hour drive, and we were in the presence of our new pet ducks. A breeding pair of Indian Runner ducks. The white duck is male and the brown and white duck is female. She lays 5 eggs per week, and if we ever have a broody chicken we may be able to hatch some baby ducklings (though we have no plans to do this at the moment). We have named them Oxford (male) and Cambridge (female). Cambridge is already laying and her eggs are larger than those the chooks produce. Speaking of the chooks, they hardly bat an eye lid when Oxford and Cambridge were introduced to the run. Honestly, I was anticipating some sort of territorial display or intimidation behaviour, but nothing happened. The chooks were more interested in their food and the ducks more interested in the pond! I honestly don't know why we didn't get ducks sooner. They have the most beautiful nature and don't tear up the grass like chickens do. They absolutely LOVE their pond, and spent most of their first afternoon swimming around in the water, duck diving down (the pond is deep enough!) and eating what they could find on the pond floor. They needed their own living quarters though, so I spent today making a very thrifty nesting box. But more about that tomorrow. I would LOVE to have ducks someday. And I love how you expanded your run- looks exactly like ours. Seems like everyone is making their run bigger these days- Rhonda is working on it too. Morning, I found your blog from Rhonda's. Can't wait to read along. I agree with you about ducks. I got 4 runners as babies late last year and have just (5 days ago) had babies hatch in the incubator. Ducks will always be a part of my pen from now on. Enjoy the eggs. Hi Sam, we have kept 5 out of 7 (2 we sold to a friend). I'm hoping we have a few girls out of them. Man they grow quickly! Lucky you getting eggs. My lady ducks appear to have gone off the lay either that or they are laying somewhere when I let them out to free range in the afternoon. Just enjoyed your duck eggs as a duck egg omelette today! Delicious. Thank you. The marvels of modern medicine.